Americans are warming to the Republican tax law, and becoming more confident in the economy as a whole. They just aren’t sure that President Trump deserves much credit. 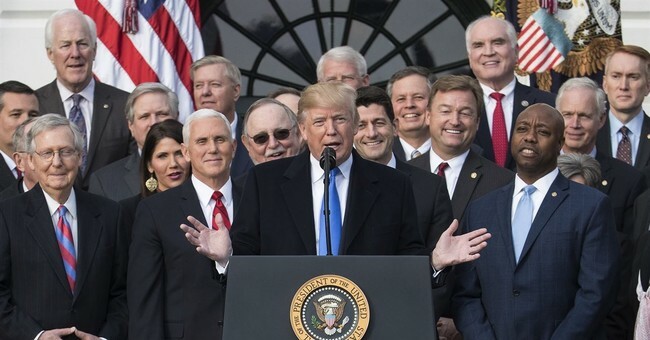 The tax overhaul that Mr. Trump signed into law just before Christmas remains relatively unpopular and highly polarizing, according to a new poll conducted for The New York Times by SurveyMonkey. But support for the law has grown significantly over the past month, and more Americans believe that they will receive a tax cut. Forty-six percent of Americans strongly or somewhat approved of the law in early January, up from 37 percent when the bill was nearing passage in December. At the same time, falling unemployment, accelerating economic growth and a surging stock market have made Americans increasingly positive about both their own finances and the overall economy. That could be good news for Republicans hoping to overcome Mr. Trump’s unpopularity in the midterm elections. As I mention in that tweet, 55 percent of Americans still don't anticipate receiving a tax cut under the new law, with just 41 percent expecting their tax burden to decrease. In reality, nonpartisan analysts have confirmed that eight in ten taxpayers will get cuts in 2018, including 91 percent of middle income earners. The improvement in public perception of the law, it appears, has been driven almost entirely by positive news from businesses, based on the corporate tax cuts. In other words, there's a lot of upside left in these numbers once Americans start seeing the evidence of the law's across-the-board tax reductions in the form of larger paychecks. New withholding tables are being published next month. Here's another way to think of it: This survey shows the law at (46/49) with only 41 percent of Americans expecting a tax cut. The number who will actually receive a tax cut is approximately double that number. It's not unreasonable to expect throngs of pleasantly surprised Americans pushing these polling numbers significantly higher in the coming months. Republicans would be wise to trumpet the law's achievements and outcomes as loudly as possible, and to relentlessly remind voters about the many now-disproven lies they were fed by Democrats. It's nigh impossible to demean $350 billion and more than 20,000 new jobs as "crumbs," but I'm confident some will try. We'll see how that works for them.